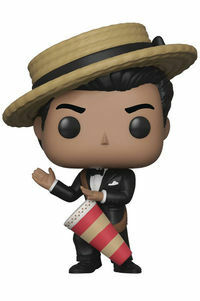 Funko is thrilled to announce that I Love Lucy -- the classic television sitcom -- is the latest addition to Pop! Collect Lucy Ricardo in her iconic blue and white polka dot dress, and her bandleader husband, Ricky Ricardo, holding his classic conga drum. In addition, you can find Lucy in her outfit from her stint working at the candy factory! Legal Notice: Entire contents trademarked (® or TM) and copyrighted (©) 1986-2019 by Things From Another World, Inc. and respective copyright and trademark holders. All rights reserved. Page rendered at 2019-04-19 11:39:27 in 0.169 seconds.